La Befana that you might not expect! Santa Claus is the best known Christmas gift-bringer; but, he is not the only one. It is said that St. Nicholas was an early Christian bishop who anonymously gave dowries to three young women so that they could marry. However, that doesn't explain Santa Claus' white beard, fur coat, home at the North Pole, reindeer sleigh, and, least of all, his association with elves. The bishop St. Nicholas was always depicted with a black beard, miter, and crosier. 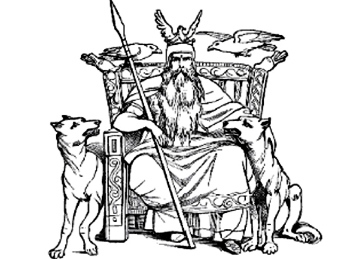 Some say the white-bearded image of Odin High-King of the Norse pantheon, (click for picture) was grafted onto the story of St. Nicholas, and he was given the role of bringing toys to children. But, wherever he came from, he has always been the quintessential jolly grandfather who loves children. Another gift-bringer tradition from northern Italy tells of a grandmotherly witch who brings presents and candy to children on January 6, the feast of Epiphany. Her name is La Befana and she is more beloved to Italian children than Babbo Natale which is what they call Santa Claus. The story of La Befana is that the Three Wise Men (Kings, Magi) had traveled for a very long time in search of Bethlehem. One night they became lost, and came to rest on the doorstep of an Italian grandmother named Befana to ask for directions. Befana was so busy with her housework that she was unmoved when the Wise Men told her of their search for a newborn king. She continued sweeping as they recounted their story of how this child would grow up to be the most important king that ever lived. Befana gave them directions to Bethlehem, but said she was too busy with her work to assist them with their quest. Nevertheless, they invited her to accompany them to pay respects, but she stubbornly refused. Later in the night, a brilliant star appeared in the sky. Its beauty and significance quickly made Befana realize she had made a terrible mistake. She gathered up toys and presents for the mysterious child king and tried to run after the Wise Men, but her old legs couldn't catch up with them. In sorrow, she wept over the broom that had seemed so important the day before. The sincerity of her tears gave the broom new life, and it scooped her up into the night sky to search for the Wise Men she had treated so badly. La Befana has never found the Three Wise Men or the child they searched for, but every year on January 6, the Feast of the Epiphany, she flies over the homes of the children of Italy leaving presents with good boys and girls. 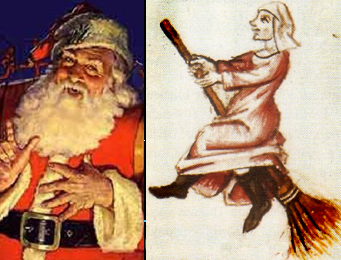 La Befana has a pre-Christian lineage, too. She was called Holle or Hulda in other parts of Europe were she was still venerated by superstitious people and denounced by clergy as late as the 15th century. Holle was believed to fly over the fields on the night of the Winter Solstice and bless the sleeping crops. She left practical gifts of wood, flax pods, and coal. She made it snow by shaking her pillows while she did her housework. She could appear as an old krone or a lovely maiden dressed in shining white robes. She is also known a Frau Gode or Fru Freke (Frigge) meaning Odin's wife. I guess that makes her Mrs. Claus and much more powerful than we give her credit for. It also means that Mrs. Claus' first name is Holly. Father Christmas brings presents in England. In France he is called Père Noël. The English tend to use his name synonymously with Santa Claus now, but their historical roots are quite different. Unlike Santa, Father Christmas was never associated with a saint or god. He was first mentioned in print in 1616, when Ben Johnson wrote Christmas, His Masque, which featured a character symbolic of the season itself and called him "Old Christmas." Over the following 250 years, many British plays included similar characters variously called "Sir Christmas," "Lord Christmas," and "Old Father Christmas." Their main purpose was to encourage the celebration of Christmas with feasts, parties, gifts, dancing, decorations, and charity, especially in the bleak times when the Puritans were trying to abolish the "pagan holiday." In Germany, gifts are brought to children on Christmas Eve by the Weihnachtsmann, literally the Christmas Man, who is depicted with a white beard, red fur suit, and carrying a Christmas tree. But, in some parts of Germany another gift-bringer is the Kristkind. Kristkind translates as Christchild, and is described as Baby Jesus and sometimes as a child or angel who brought Jesus gifts. 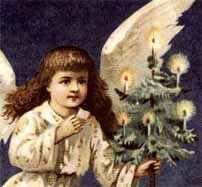 He (or she, for the Kristkind is usually depicted as a female angel) was introduced by the 16th century reformer and founder of Protestantism, Martin Luther, who was concerned that reverence for St. Nicholas was too close to idol worship. He encouraged his followers to tell their children that the presents they received in their stockings or boots on Dec 5 were from the Kristkind, not St. Nicholas. Eventually, German children enjoyed both gift bringers. They now receive candy from St. Nicholas on St. Nicholas Eve and gifts under the tree on Christmas from the Kristkind or Weihnachtsmann. Zwarte Piet or "Black Peter." 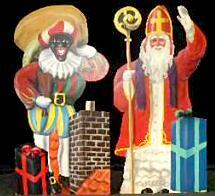 In the Netherlands, Sinterklaas arrives on horseback with his African assistant, Zwarte Piet, during the night of Dec 6! Black Peter has been his companion since 1850, but lately has become the focus of protests over the use of blackface and gross stereotype pantomime because it reflects a colonial and racist attitude toward Africans. The American version of Santa Claus with his sleigh, reindeer, and elves, is encroaching on the Sinterclass tradition. This, too, has drawn protests from Dutch conservatives. They say that Santa Claus is fat and vulgar! In Austria, Nationalists have organized against Santa Claus as well because he is too American! In Sweden the Yule Goat brought gifts on Dec 13. The goat—a symbol associated with the thunder god Thor—knocked three times on the door with his horns and bore presents for the children. He arrived with a man dressed like Father Christmas. Around 1900 the man, instead of the goat, became the gift-bringer, probably to keep up with the popularity of Santa Claus. The role of the Yule Goat wasted away over the next century until he became little more than a cute tree ornament. Melchior, and Gaspar in a 6th c. mosaic in the. Basilica of Sant'Apollinare Nuovo in Ravenna, Italy. In Spain, the Reyes Magos—meaning Royal Magi or Three Kings—bring gifts on the last night of Christmastide or 12th Night. This is the night when the Magi are said to have arrived in Bethlehem to pay respects to the Christ child. In Southern Italy, Sicily, and Spain, family creches or nativity scenes are displayed in the the home. Before Christmas Eve, the Virgin Mary, Joseph, the ox, and donkey are set up with an empty manger. On Christmas Eve, angels are added and the Baby Jesus is revealed in the manger. The shepherds are added the next day. 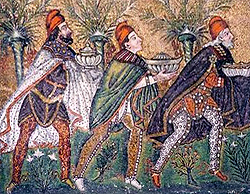 Each day thereafter additional figures are added until 12th Night when the Three Kings are added and everyone exhanges gifts. In some areas, the custom is to place a comic character called the caganer in the crowd of worshippers. The caganer can be an infamous person or a figure doing something indecent. Popular celebrities are often included as well. This year, President-elect Barak Obama, his wife Michelle, French President Nicolas Sarkozy, and his wife Carla Bruni are the best selling figures in Italian Christmas markets. Who's bringing presents to your house this year? Barak Obama? Sinterklaas? La Befana? Whoever it is, we wish you and yours a very Merry Holiday and a Happy New Year! If you want to add this article to your list of favorites or email it to a friend, please use this permanent URL, https://stores.renstore.com/-strse-template/0812B/Page.bok. Permission is granted by the author to quote from this page or use it in handouts as long as you include a link back to Renstore.com.